Pasta of your choice, at the moment I love Sainsbury’s fresh Fusilli which cooks in 4 minutes. Chop 6-8 sun dried tomatoes roughly and then put into a mini chopper/food processor with the garlic, red wine vinegar, seasoning and some of the olive oil from your jar of tomatoes (you could just use extra virgin olive oil if you prefer). Whizz this up into a dressing to toss over the freshly drained pasta (it’s important you don’t leave the pasta to dry out). Leave to cool slightly then add some more roughly chopped sun dried tomatoes and if you like, olives, capers, toasted pine nuts etc for texture. 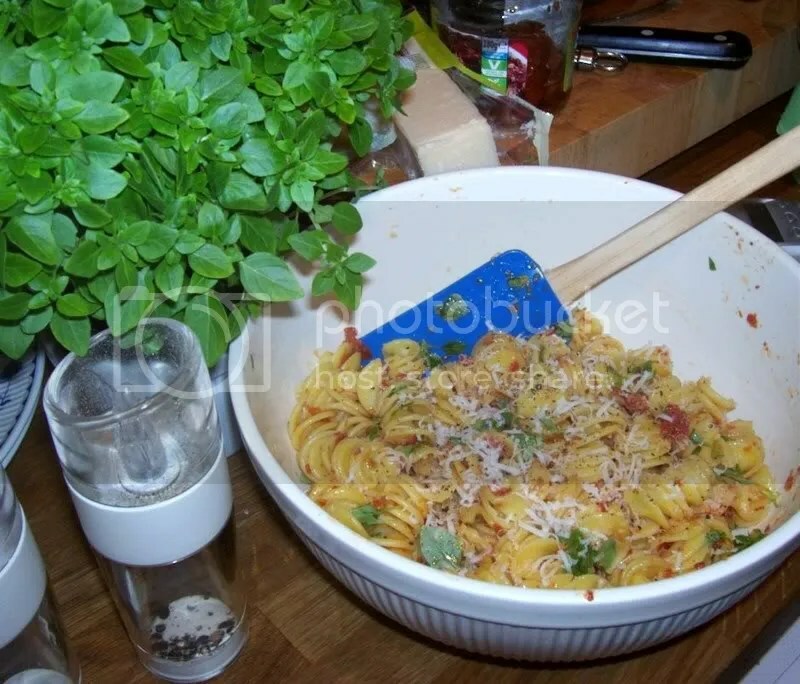 Before you serve, stir in roughly chopped basil and grated parmesan. This is so nice warm and even better cold, days later from the fridge! « How can we sleep while our beds are burning?